1972: California Attorney Larry Booth Obtains 4th Million Dollar Verdict in California History. In 1972, the highest paid player in the NBA made $375,000. The average house in the U.S. cost $27,550. The minimum wage was $1.60/hr. A gallon of gas cost 36 cents. And a million-dollar verdict in a personal injury case was virtually unheard of. It had been accomplished just three times in the state of California. Michael Metzger was a 42-year-old welder when he was hired to install equipment at the premises of Ocean Salt Co. in the Long Beach harbor. During the project, another worker dropped a metal pipe (weighing 20 pounds) from a 73-foot-tall tower, striking Mr. Metzger. He sustained injuries to his neck and shoulder, which required six surgeries and prevented him from ever working again. 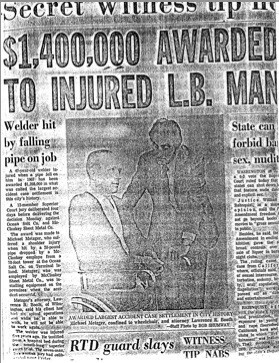 Because the pipe that struck Mr. Metzger during the construction site accident was quite thin and lightweight, the defendants argued that his injuries could not have been as serious as he claimed, that his surgeries were unnecessary and that Mr. Metzger had psychological problems that caused him to exaggerate his injuries. In order to counter those arguments, Larry Booth utilized an accident reconstruction expert, who calculated that the impact from being hit by this pipe, in light of the distance from which it fell, would be equivalent to dropping a 16-pound shot put on someone from the fourth floor of the Long Beach courthouse (which happens to be where the trial was conducted). During closing argument, to the dismay of the judge, Larry dropped such a shot put on the courtroom floor, right in front of the jury, dramatically showing how much impact was truly involved in Mr. Metzger’s tragic accident. Four days later, on Dec. 4, 1972, the jury returned a verdict of $1,398,000. The next day, the Long Beach Press Telegram covered the verdict on its front page.